I didn't bother with narration about time, because context takes care of that for me. 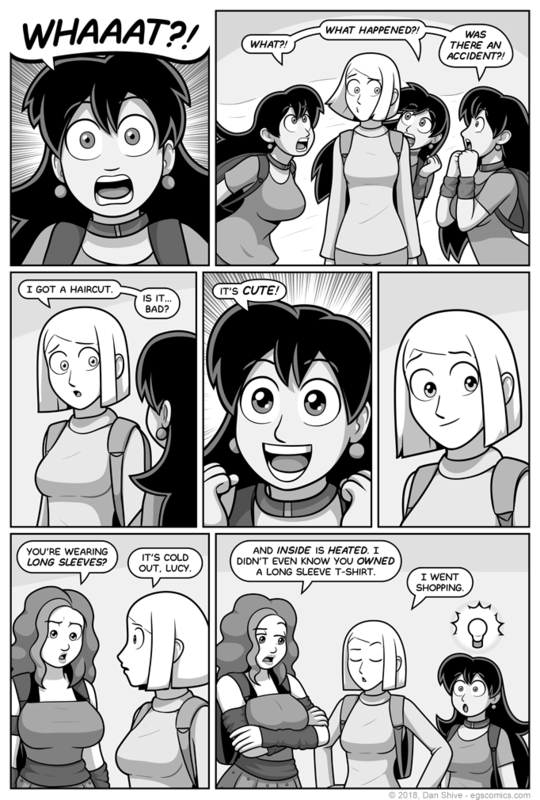 The previous comic was a moment from years ago, and this is the Monday following the weekend Diane got a haircut! And also, monsters attacked the mall. Whatever. I'm poking some fun at reader's reactions with "was there an accident", as at least one person really did ask that. To them, I GUESS you get a cookie. Lucy is at least somewhat aware of the temperature, as she is wearing those fashionable arm warmers! And what may or may not be an armored skirt, which is also fashionable. Hey, it's my comic. I can decide what's fashionable, and 80's work out attire is BACK, baby! It's possible my memory of this isn't 100% accurate, but as I recall it, there's an old issue of The Uncanny X-Men in which Storm gets a rad mohawk hairstyle for very personal reasons. Her teenage teammate, Kitty Pryde, reacts with dismay upon seeing the hair, and cries out "how could you" while running away crying with her face hidden behind her hands. It is a moment I find baffling. I can understand Kitty being caught off guard, even concerned by the sudden change, but wow. Way to not care about your friend's feelings, Kitty. Anyway, if your friend gets a haircut, maybe don't do that. Or ask if there was an accident, because seriously. Still experimenting with comic size, which is tricky, because I'm trying to make things look as good as possible for as many people as possible on as many things as possible, which... Blargh to that. Blargh. The main reason this is a little smaller (still 10% bigger than the old size) is because I hadn't considered how it will affect tall panels. These recent couple of pages are three rows with no issue, but with big splash panels or covers, it becomes one. For some viewing options, that issue is unavoidable, but I'm trying to optimize as best I can for as many people as I can! Wait, is this what our leaders in government feel like? Struggling desperately to find a solution that satisfies the needs of most, and knowing they can never satisfy the needs of all? That you can truly never please all of the people all of the time, even though you rose to a position of power to humbly serve the people? Wait, I forgot politicians are almost universally corrupt. Never mind.